Yang Luchan und das originale Taijiquan - neue Fragen zur "Inneren Kampfkunst"
Yang Luchan aus Yongnian - Gründer des Yang-Stil-Taijiquan oder des Taijiquan überhaupt? Im Kontext der Symposien wurden die unterschiedlichen Positionen zur Historie und Charakteristik des Tai Chi Chuan besonders deutlich. Die offiziellen Familienvertreter sind sich uneins über die Taiji-Entwicklung. Eine Unterhaltung mit Meister Wu Wenhan mit Dave Barrett, die von Yang Jun übersetzt wurde. Der Artikel erschien im Journal 34, Frühling 2014. Es ist unklar, ob die Brisanz der Aussagen zur Chen-Stil beim Interview und der anschließenden ersten Veröffentlichung erkannt wurde. Die folgende Nichtauffindbarkeit im Web wird diskutiert im Zusammenhang mit dem Thema "'Yang Family Secret Transmissions" und "Yang Family Forty Chapters": Yang Family und die Updates hier: Yang Family. 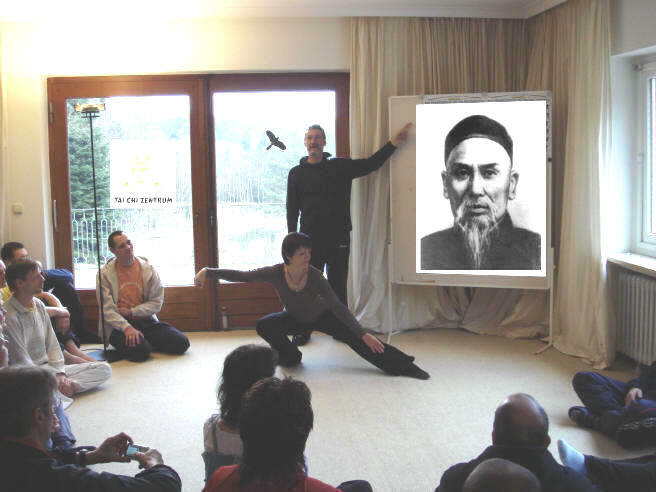 Je nach Standpunkt gibt es sehr unterschiedliche Darstellungen des Yang-Taijiquan-Gründers Yang Luchan. Daher bietet sich genaueres Hinschauen an. Es wird dabei rasch deutlich, dass nur wenige Forschende an Ideologie-Freiheit interessiert sind - es überwiegen häufig "Sachzwänge", Loyalität, Opportunismus und kommerzielle Aspekte. Vor den Hintergrund beider Symposien sollen einige Bereiche behandelt werden, die damit im Zusammenhang stehen. Ausgangspunkt sind offizielle Slogans des Veranstalters Yang Jun. Er repräsentiert die 6. auf Yang Luchan folgende Generation. Er und der Veranstalter des 1. Symposiums 2009, Meister Yang Zhenduo, 4. Generation der Yang-Family, haben sich vielfach eindeutig festgelegt bzgl. der Historie und insbesondere bzgl. Yang Luchans Taijiquan. Mit ihrer Weltsicht stellen sie sich damit in Opposition einer großen Zahl von Forschern und Praktizierenden, die andere, teilweise viel plausiblere Meinungen vertreten. Zentrale Slogans der Symposien lauten bekanntlich "All Taijiquan is ONE Family" und "Learn directly from the source". "Learn directly from the source"
Hinweis: Aus Gründen der Übersichtlichkeit sollen hier zunächst Jiang Fa, Zhang Sanfeng, Wang Zongyue und Li Yiyu nicht behandelt werden. Die Quelle von Yang Luchans Tai Chi war das Dorf Chenjiagou und sein Lehrer war ein Mitglied der Chen-Familie, nämlich Chen Changxing. Was er dort lernte, hatte weder den Namen Taijiquan noch hatte es eine Theorie. Es hieß auch nicht "Innere Kampfkunst". Auch war es offenbar nicht die im Dorf überlieferte Kampfkunst sondern eine andere. Demnach hat Yang Luchan nach dem Unterricht in Chenjiagou zusammen mit Wu Yuxiang erst das Taijiquan entwickelt - auf der Basis der ihnen zugänglichen "Klassischen Schriften". Wu Yuxiang hatte von Yang Luchan gelernt und war danach in der Stadt Zhaobao von Meister Chen Qingping (1795-1868) unterwiesen worden. Ein Großmeister, dem das Erforschen der Taiji-Geschichte sehr wichtig ist, ist Wu Wenhan. Seinen Studien zufolge, haben Yang Luchan und Wu Yuxiang das Taijiquan selbst entwickelt. Dabei sei die Weichheit ein wichtiger Bestandteil der Theorie, wie sie sich in den Klassikern offenbart. "All Taijiquan is ONE Family"
Dieser Slogan wird von den Veranstaltern begründet mit der Behauptung, alle Familienstile wiesen identische Charakteristika auf. Dagegen wenden sich ernstzunehmende Forscher mit ähnlichen Argumenten wie oben ausgeführt. Die spätere Taiji-Theorie der Chen-Familie wurde von Chen Xin geschrieben - der jedoch nach eigenem Eingeständnis weder Tai Chi noch eine andere Kampfkunst je praktiziert hatte. Zudem wurde im Chen-Stil laut Meister Chen Fake nie der Begriff "Innere Kampfkunst" benutzt. Auf Veranlassung von Wu Tunan wurde der Chen-Stil auf einem Treffen in Peking daher auch nicht als Taijiquan klassifiziert sondern als eine "Äußere Kampfkunst" wie Shaolin. Dafür sprechen auch die buddhistischen Form-Namen, die die anderen Stile, die auf Wudang/Taoismus basieren, nicht haben. Offenbar gab es nach Luchan auch keinerlei Austausch mehr zwischen der Yang-Familie und der Chen-Familie. Nicht einmal auf dem historisch wichtigen Treffen 1929 in Peking waren Chen-Vertreter anwesend. Siehe das Skript "Yang Luchan und das originale Taijiquan - neue Fragen zur Inneren Kampfkunst" (Quelle: www.tai-chi-ausbildung.net ). "Wu Tunan visited the Chen village in 1917. There were few educated people in the village at the time and he was directed to meet Chen Xin, this was before Chen Xin's book was published. Chen Xin was very frank in his interview with Wu Tu Nan and gave him an account of how Taijiquan came to the Chen village . He said that both Taijiquan and the indigenous Chen family Pao Chui was practiced in the village but that Taijiquan came down from Jiang Fa. He also introduced Wu to Du Yu Wan who practiced Taijiquan and who said his art came down from Jiang Fa who was of the Wudang lineage, Du's subsequent book on Taijiquan in 1935 confirms this view and the authenticity and accuracy of Wu Tu Nan's interview material. Quelle: Arbeitskreis "Yongnian Gesellschaft von Fu Zhongwen". Chenxin had told Wu Tunan that he was writing a book on Taijiquan. Wu then asked Chenxin whether he practiced Taijiquan. Chen Xin replied that his father had let his older brother learn martial arts but had made him get an education instead so he did not know any martial arts. Wu then asked how he was going to write a book on martial arts if he did not practice martial arts. Chen replied that Taijiquan is based on the Book of Changes and that he felt that as long as an art conformed to the Book of Changes it was Taijiquan. So he intended to use the boxing postures of Pao Chui and relate them to the Book of Changes and that his purpose of the book was to show how the Book of Changes was related even to martial arts, it was not his intention of writing a martial arts manual...."
A conversation with Master Wu Wenhan By Dave Barrett, Translated by Yang Jun. This article appeared in Journal 34, Spring 2014. In the middle of the Qing dynasty in Hebei Province, Yongnian County, Guangfu town had two famous Taiji masters; one was Yang Luchan (1799-1873), and the other Wu Yuxiang (1813-1880). At that time Yang Luchan returned from his studies with Chen Changxin. So Yang Luchan’s job was teaching Taijiquan in his hometown and he and Wu Yuxiang became good friends. At this time there was no special term for Taijiquan. The Chen style was referred to as Long Fist, in Yongnian County the term was Cotton Fist or Sticking Fist. So after Master Wu Yuxiang learned from the Yang family, he went back to Wenxian County, Zhaobao town and found a master named Chen Qingping (1795-1868). During that time Wu Yuxiang’s brother, Wu Changxin found a book in a salt shop by Wang Zongyue called the Taiji Classics. So he gave this book to Wu Yuxiang and he brought it back to his hometown. From this point both Yang Luchan and Wu Yuxiang began to follow the theories in this book, also they brought their local culture and martial styles together. Actually, they also combined what they had learned from Chen Changxin and Chen Qinping, they combined many things together with the theory of Wang Zongyue to create a new martial art we now call Taijiquan. They were influenced by Wang Zongyue’s concepts, which formed a new base and foundation for the motions. Of course they learned from the Chen style but at that time Wang Zongyue’s book was unknown to the Chen masters. Both the Yang and Wu styles developed here in Yongnian County started by using the Chen form, “Lazy about Tying the Coat” which evolved into our Grasping the Bird’s Tail and finished with Bend the Bow Shoot the Tiger, so they are similar in structure from start to finish. The third point I’d like to make concerns Push Hands. In the Chen style, when they used this in the old days it was a very basic technique: just moving back and forth. Bringing this basic exercise back to Guangfu town, Yang Luchan began to develop more detailed techniques. The Yang family made it’s living from teaching martial arts, they had a very rich experience and effective training methods. The Wu/ Hao style also developed more complex Push Hands patterns. They contributed a good deal to the development of Push Hands and weapons training. We should say that Wu Yuxiang and Yang Luchan founded Taijiquan. DB: These two gentlemen were close friends, they lived in the same town, did they work together to create the form sequences we have today? WW: Yes. They worked together and used many of the same form names and although the two styles are different they share many similarities. Wu Yuxiang remained in Guangfu town and continued to research and develop Taijiquan Theory. Taiji’s theory comes from three sources; first is Wang Zongyue, second is Wu Yuxiang and the third is Li Yiyu. Li Yiyu was not a professional martial arts person but he had a disciple: Hao Weizhen (1849-1920). Hao He was his styled name. He spread Wu style to the public. The reason Taijiquan is so popular and successful comes from the collaboration between Wu Yuxiang and Yang Luchan. Since Yang Luchan, the Yang style has developed practical training methods which work quite well. 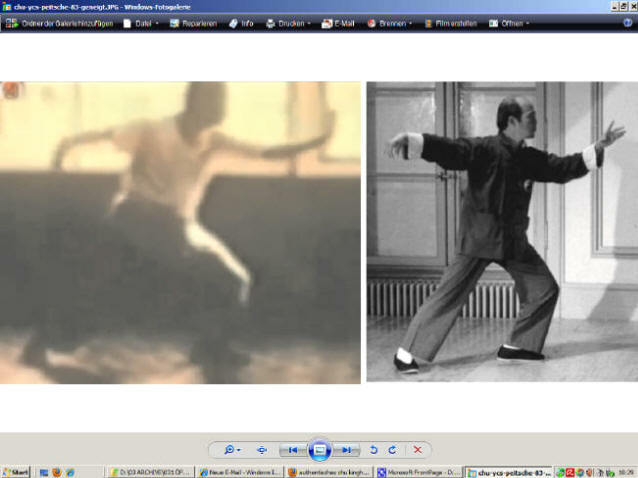 The Wu/Hao contribution has been to develop the theories of Taijiquan. The latter generations of these two families also worked together to combine practice and theory and improve the level of training. Here in Yongnian County, Taijiquan developed not just by continuing Chen style techniques. They learned from the Chen system but they redesigned and created new forms. This is of particular interest to me and I spend my time researching the development of Taijiquan. From my point of view Taijiquan was not simply originated in Chenjiagou. After these two gentlemen came back from studying Chen style they created a new martial art called Taijiquan and Guangfu town was its birthplace. Of course there is a relationship with the Chen style but it was not just a simple transition. Later on, when Chen Fake was teaching in Beijing in the 1950’s, there were debates as to whether his style was really Taijiquan . What was missing from the Chen style were any of the 13 kinetic energies and theories from Wang Zongyue. To help popularize taijiquan, Yang Luchan gradually deleted from the sequence of movements some difficult actions such äs jumps and leaps and vigorous punches and kicks. His third son Yang Chienhou made further revisions, and this series became known äs "Medium Frame" taijiquan. Later the form was further developed by Yang Chengfu, the third son of Yang Chienhou, into the present style, known äs "Large Frame" because of its extended postures. The style of Yang Banhou is known äs "Small Frame." The Yang style which first came from Chen style is called "Old Frame." Yang style spread äs the three generations became renown and taught many students, not only in Beijing but throughout China. In his era, Yang Chengfu became the most famous and most popular representative of the family style. His teachings were captured in books by his students, and their publication contributed to the preservation of Yang style taijiquan. He once said, "Taijiquan is an art with strength concealed in gentle movements, like an iron band in a velvet glove, or a needle concealed in cotton." Yang style taijiquan is characterized by movements that combine vigor with gentleness and that are gentle, natural, flexible, continuous, evenly paced, relaxed, and synchronized with one's mind. Today, Yang style is the most widely known style in China and the world. Actually, the most important Yang Style "classics" are from Wu's writings, except for Wang Zongyue's Taijiquan Theory, and there are some who believe Wu even penned it as well as coined the term "Taijiquan" around 1854, but that is another story! This Symposium brings you an abundance of exciting programs throughout the entire event. and not only expresses the authenticity of the presentations, but also indicates the depth of resources. These presentations bring together the wisdom of Chinese culture and the precision of modern science through master’s workshops, evidence-based literary review and academic sessions, and other special events designed to foster an exchange of knowledge and cultures. THE GRANDMASTERS AND TAI CHI CHUAN STYLES The Grandmasters of the family styles are the big stars of the program. These lineage holders shine each day in more than one sparkling format, generously sharing the uniqueness of their forms and revealing their traditional wisdom. As a participant, you get to meet each one several times. All of them deliver a “keynote” speech, each presenting major components of his style and revealing his personal insights into tai chi chuan’s philosophy and unique precepts. All the styles are linked by shared characteristics, by history, and by a common philosophy, into one “family” of Tai Chi Chuan. The following article was once originally part of Master Chen’s former webpage www.chenzhonghua.org. It gives us Grandmaster Hong Junsheng’s first-hand account of what actually happened in the talked about encounter in a martial arts tournament in Beijing between Great Grandmaster Chen Fake and Wu Tunan. I thought it would benefit everyone interested in Taijiquan history to read this article and learn of Grandmaster Hong’s first-hand knowledge of this encounter. I want to thank Shifu Chen Zhonghua for allowing me to re-publish this article in Practicalmethod.com. At one of the first government sponsored traditional martial art competitions in Beijing, in 1952, Chen Fake was invited to attend, as one of the judges. The famed Wu Tunan (also known as the Northern Star of Taijiquan) was in charge. A discussion came up, with regards to categorization of styles,leading to a great deal of controversy as to where Chen Style Taijiquan belonged. Some suggested that it belonged to the External Division. At the time, the slow and gentle nature of Yang style Taijiquan was considered the standard of Taijiquan. What Chen Fake practiced certainly did not fall fall into this category. Others countered that it is, after all, called Chen Style Taijiquan, so it should be included as part of the Internal Division. Master Wu Tunan did not concur. He felt that Chen Style should be treated as an external style, similar to Shaolin. Someone turned to Chen Fake, Master Chen, you are the standard bearer of the Chen Family, is it external or internal? Hong Junsheng, a disciple of Chen Fake, was understandably upset about this treatment of Chen Style. He began his Taiji studies with Wu style, and later switched to Chen Style. For him, Chen and Wu were both authentic Taijiquan styles, and both were internal. He begged his teacher for an explanation. Master Chen’s answer had nothing to do with either Chen or Wu styles: My ancestors invented it. My great grandfather practiced it [translator’s note: This refers to Chen Changxing, who taught Yang Luchan, the creator of Yang Style]. My father practiced it. I practice it now. We do not call it Taiji. We do not have a name for it. You can call it anything you want, I will still practice it the same way I was taught. I don’t care what they put in the name! Chen Fake was certainly not a philosopher. However one might appreciate the profound depth of his perspective. He saw the name as nothing more than a shallow symbol of the object. What Chen Fake learned and taught was Chen Style Taijiquan. The change of the name by others or the views of others will never affect what it is. Is Chen Style Taijiquan the original source of Taijiquan? Is Chen Style internal? State whatever opinion you have and present all your research papers. You might even patent the name, and forbid the Chen Village masters and direct lineage holders from using the name. But can you change the fact that it is their art and what they do is the right way? You will never change its essential nature. It is what it is.